The year1898 is winding down. 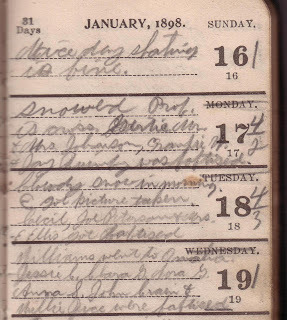 Charles Leonard (Lennie) Davis, age 17, of Wakefield, Nebraska is still faithfully writing each day in his pocket size diary. 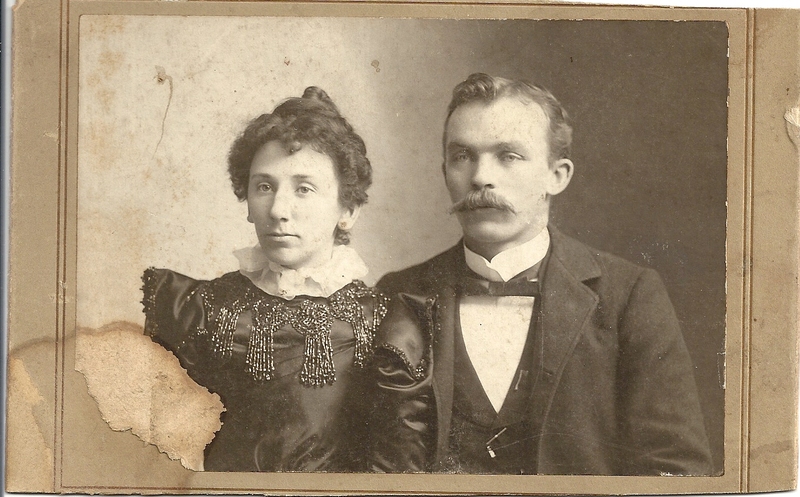 Today's photos feature Lennie's sister, Olive and her husband, Charles Emil Schulz. As of December 1898 they are still a young wed couple with no children. 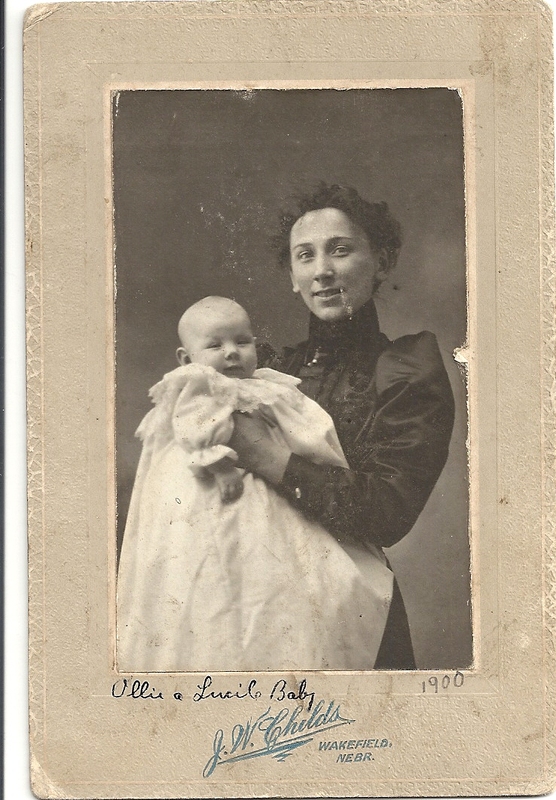 Their first baby, Lucile M Schulz, will be born September 1899 in Wakefield, Nebraska. While Ollie's family has been in this country for generations, her husband Charles emigrated from Germany in about 1883. Fred Poff came in (to town). Snowed in afternoon. Ellis (Paulson) and I took girls out walking. Cecil is mad. Will, Ellis, Sam, Ella, Mable, Jennie, Edna and I went to lake. Nice day. Went to lake at night. Fred Poff staid all night. Another nice day. Had examination. Sam, Ellis & I ate ??? of peanuts. Went skating. Ada & Clara walked in. Prof Culver visited school. Went out with girls. Myrt & Ollie went to Allen (nearby town of Allen). Myrtle and Olive are Lennie's older sisters. Olive (Ollie) is married to Charles Schulz. Lennie may already be acquainted with Charles' niece, Alma Kuckku who at this writing is only 5 years old. 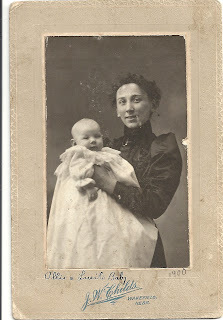 When she turns 18, she and Lennie will wed.
Lennie and Alma's wedding will be Aug. 2, 1911 at Crystal Lake in Dakota County, Nebraska. Witnesses will be William H. Kuckku (Alma's older brother) and A. R. H. Miller, Minister. Guests will include Elizabeth von Bergen, Chas. E. Schulz and wife Ollie*, Myrtle Davis, Earl Davis, Lucile Schulz, Leonard Schulz,and Vivian Schulz. *Ooops. I named Charles' wife as Ollie. Sadly, Ollie will die in childbirth in 1908. At the wedding will be Charles' second wife, Nellie. Charles and Nellie will have three children together, Vivian, Lorraine and Helen. But that is still 12 years in the future when Lennie writes today's entry. Banked house. Went down to Art's. Boys went to show.It is possible that when Lennie says he banked the house, he is talking about placing dirt against the foundation to keep out the cold. This may be an erroneous assumption on my part...surely they would have done that earlier in the fall and would not have waited until December. Ada Adair went home. Sam, Ellis, Fred and I had a time. Ate dinner at home. Victor got his hand hurt. Snowed at night.Victor's hand is injured badly. Next week Lennie notes that the Doc cut off his middle finger. Ranked 3 in class. Prof. Culver gave metal (???) to school. Snowed at night. A dull day. Wrote a letter to Ada. Bessie Allen ate at Drs. Boys went skating. Went to choire practice at Lecture room. Entertainment at Presb Church. Went out walking. Went to Entertainment. Wrote letters to Boss and to F. T. (Flora Town) Went skating in bandwagon. Thanksgiving is upon us. Er, I mean, upon Lennie and his family. He's been boarding with Dr. Rowse, presumably to be closer to school during inclement winter weather. On Thanksgiving he mentions only "No school, went home for dinner." The approaching November brings to mind the custom of our ancestors, hallowed by time and rooted in our most sacred traditions, of giving thanks to Almighty God for all the blessings He has vouchsafed to us during the year. Few years in our history have afforded such cause for thanksgiving as this. 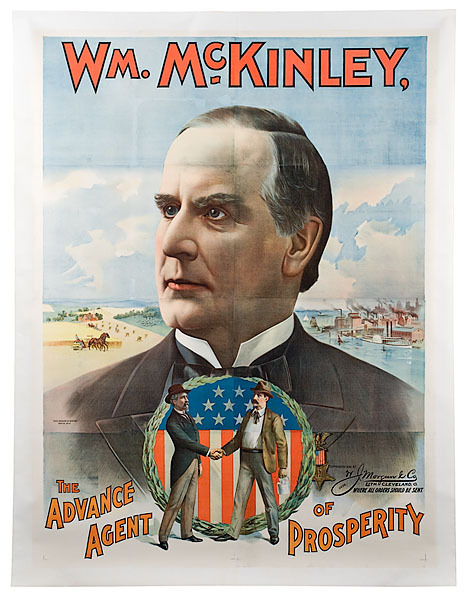 We have been blessed by abundant harvests; our trade and commerce have wonderfully increased; our public credit has been improved and strengthened; all sections of our common country have been brought together and knitted into closer bonds of national purpose and unity. The skies have been for a time darkened by the cloud of war, but as we were compelled to take up the sword in the cause of humanity we are permitted to rejoice that the conflict has been of brief duration and the losses we have had to mourn, though grievous and important, have been so few, considering the great results accomplished, as to inspire us with gratitude and praise to the Lord of Hosts. We may laud and magnify His holy name that the cessation of hostilities came so soon as to spare both sides the countless sorrows and disasters that attend protracted war. I do therefore invite all my fellow-citizens, as well as those who may be at sea or sojourning in foreign lands as those at home, to set apart and observe Thursday, the 24th day of November, as a day of national thanksgiving, to come together in their several places of worship for a service of praise and thanks to almighty God for all the blessings of the year, for the mildness of the seasons and the fruitfulness of the soil, for the continued prosperity of the people, for the devotion and valor of our countrymen, for the glory of our victory and the hope of a righteous peace, and to pray that the divine guidance which has brought us heretofore to safety and honor may be graciously continued in the years to come. 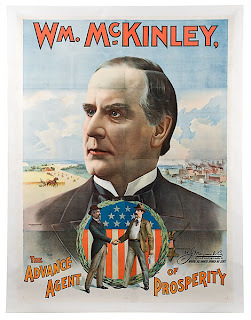 Done at the city of Washington, this 28th day of October, A.D. 1898, and of the Independence of the United States the one hundred and twenty-third. Went walking with girls in afternoon & night. Dr. brought in cot last night. Went out at night with girls. Started to have experiments in Chem. Did not have band practice last night. A dull day. Worked on ditch after school. Cecil & I went out again. Worked on composition at night. Got report of school ??? Read composition. Got 95. Had no band practice. Went to social at Neffs. Worked around house all day. May Rowse came. Truman Pff staid all night. Went walking down by the Davis dam in the afternoon. Snowed last night. Regular blizard outside. ?? & I ate dinner at school made coffee. No band practice. Cold outside but stoped blowing & snowing. Truman Poff staid last night and tonight. A nice day but cold. Went out walking. So did Ellis Paulson. No school. Went home for dinner. Went out at night but Cecil & Fred out. No school. Went skating yesterday. Put on storm windows today. No band practice. Worked around house. Went skating at lake. Dr. went to Emerson. Got back Sunday PM. May we also, in 2011, give praise and thanksgiving to Almighty God for the blessings that He bestows upon us moment to moment and year to year. 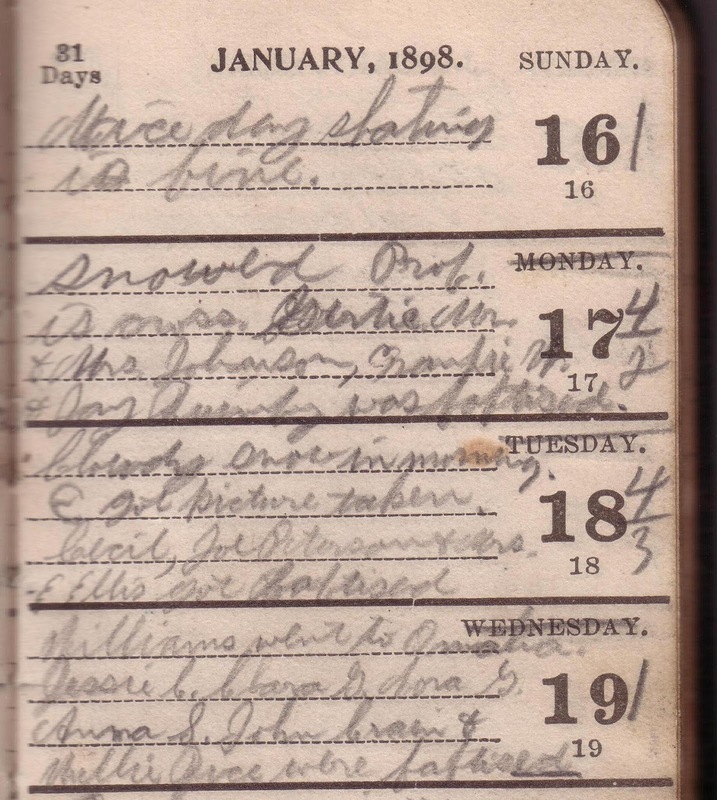 Lennie (Charles Leonard Davis) of Wakefield, Nebraska, continues with his 1898 diary. He is currently 17 years old. Lennie often mentions "walking with the girls". However, he is quite gentlemanly and does not mention their names. Or perhaps he was afraid family members might read his diary and give him a bad time. Dr. Rowse came home. Wrote a letter to F.T. According to the 1900 census for Wakefield, Nebraska, the good doctor is Dr. Robert Q. Rowse. Dr. Rowse is 28 years old as of Lennie's writing. The doctor and his wife, Sarah, will have a baby girl in the year 1900 and will name her Francis E.
I suppose you are curious as to who Lennie is referring by the initials "F.T." In the front of his diary he had a short list of addresses/names. One of those is Flora Town, Shell Rock, Iowa. John Watkins came home from Florada. Art Shearing was mustered out. Went down to Cecil's after supper. Got a picture of the ?? (can't read this) Went to band practice. Washed off buggy. Band played for Pep (?? political??) Rally. Went out with girls. A nice day. Wrote a letter to F.T. Went out with girls. Girls in school had a big time laughing at C & me. Went uptown to band practice. Didn't have none. Election day. Went uptown but did not stay. Chas. & I started to dig on 75 ft of water works. Worked on ditch. Went to social at Shellingtons. Took girls home. IOGT. The IOGT was (and is) an organization of men and women of all ages who promote the ideals of temperance, peace and brotherhood. You can find info here. Lennie mentions the IOGT meetings often in his diary. A dull day in school. I went walking with girls. Went to band practice. Dug on ditch till it rained. Went to club at Shumways. Had a hot time with Ozoea Harman. The Shumways are probably Herbert and Nellie. They have four children - Earl, Howard, Persey, Ruth. Herbert Paine Shumway was a prominent businessman in Wakefield and you can read more about him here. 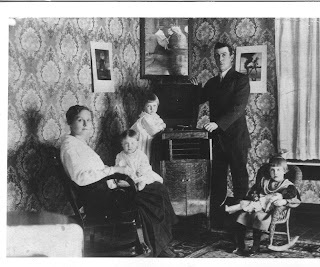 As for Ozoea, she is the only child of Dr. B. T. Harman and his wife, Margaret. Ozoea turns 15 this month. Since Lennie is so circumspect so as to not name or even write the initials of the girls with whom he goes out walking, I'm assuming that his mention of a hot time with Ozoea is an indication of an evening of fun at the home of the Shumways.